I cannot believe it is time for End Of The Year Teacher Gifts already! While some weeks flew by, others dragged by so slowly it seemed like summer would never come. It's hard to believe another school year is almost over and how old my boys are getting. This year I am doing gift cards to Target with a few little things thrown in. 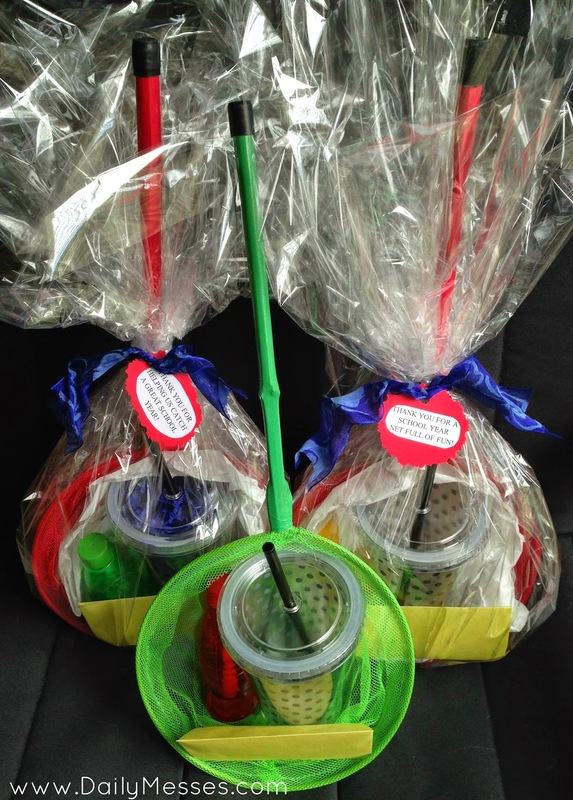 I am packing a reusable cup, a bottle of bubbles, a note, and a gift card in a butterfly net. Hubby didn't understand my seemingly hodge-podge collection of gifts, but here is my reasoning. I know Bernardo's teacher is big on reusable cups and recycling, so I included the reusable cup. I also know that some of the teachers have their own kids that will be home with them all summer, so I included the butterfly net and bubbles to help keep the kids busy (at least for a few hours to give them a break after teaching all year). The bubbles and net could always be used in class next year (Higgins almost always spills his bottle, so they probably need a ton of new bubbles). I wrapped each net in cellophane to help protect the mesh from ripping. I then tied it closed with a ribbon and a little tag (Thanks For A School Year Net Full Of Fun, Thanks For Helping Me Net A Great School Year, Thanks For Helping Me Catch A Great School Year). What are your favorite gifts to give teachers? If you are a teacher, what is your favorite or least favorite thing to receive?